On the fourth day, God created an honest day’s work so that Man could labour to pay for the keeping of the Horse. On the fifth day, God created the grasses in the field so that the horse could eat and Man could toil and clean-up after the Horse. THE NEEDS OF THE HORSE.. Here at Coronation Park we strive to produce and promote the country’s finest show horses and are re-defining “world class” with every new foal crop. It’s no accident that we continue to produce most of the Australia’s outstanding show horses, western pleasure , hunter under saddle, hacks and futurity foals. We’re proud of the level of integrity and unsurpassed care we put into our breeding programs. We have earned a reputation for honesty in this business that’s pretty hard to find anywhere these days! We believe that these “outstanding horses” from Coronation Park Stud sell themselves. We merely give you ALL of the facts and information you need to make the RIGHT choice the FIRST time in your horse / show prospect selection ~ were proud that ‘it’s more our horses that do the talkin’ … we’re just here to help in the translation! Coronation Park strives for “perfection” Our breeding program has continually improved with patience and experience over the past 40 years. Knowledge like this is a shared team effort and what you see in the pages to follow is thanks to a handful of experienced honest people with reputations as untarnished as our own that share their own ideas on the components of “world class”. We would like to express our personal gratitude to those friends and mentors we’ve made world-wide and recognize their generous sharing of knowledge and expertise. With a life times experience in equine care and a devotion to these outstanding horses that is UNSURPASSED, we pride ourselves in knowing “you never stop learning”. In the pages that follow you’ll see that our weanlings,broodmares, show horses and choice of stallions are proof of our hard work and study over many decades. OUR 250 NATIONAL, STATE, ROYAL SHOW CHAMPIONS are our proof as we continue to strive for PERFECTION IN PEDIGREE AND CONFORMATION!! 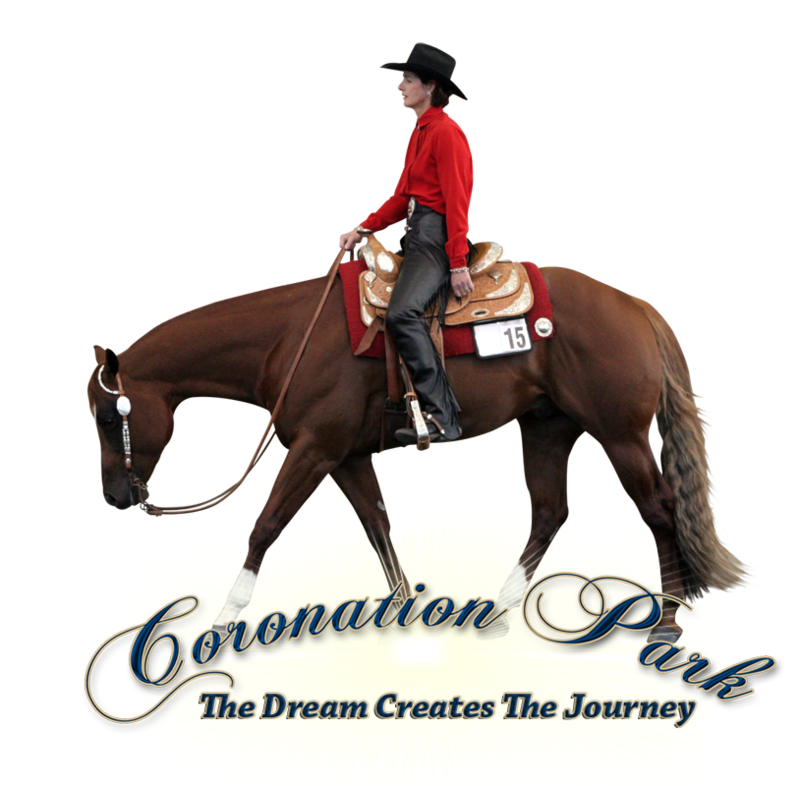 All the Coronation Park bred horses we invite you to see in the following pages, are bred, ,raised, handled and treated as future CHAMPIONS. Our MULTITUDES OF NATIONAL CHAMPIONS – TROPHY BUCKLES – SHOW RIBBONS and FUTURITY EARNINGS are nothing more than the BONUS OF RECOGNITION and ACKNOWLEDGEMENT of our GREAT HORSES. Horses born to exhibit “good temperament, versatility in use, and raised to be your life long companion”. At Coronation Park we pride ourselves in our breeding program being quite different from most breeders. Our idea of “champion” goes far and beyond the show ring. If you choose to rear your foal to be a show, pleasure prospect, pleasure weekend horse, a rodeo mount, pony club horse or a special events mount, you can rest assured that all the Coronation Park bred horses are bred and reared on a form to function formula. They run on pasture improved great horse country and are not LOCKED UP to fatten for show. All our foals romp and play on large fields on great farmland, they are grown NATURALLY with no artificial substances and DEFINALTY NO HORMONE TREATMENTS!!! They are wormed and have their feet attended to as new born foals right through to adults at monthly intervals. We give them everything they need to grow and develop to their true potential ~ veterinary checks are welcome on any horse at anytime. Special installment plans for our horses will be honoured to outstanding and APPROVED homes. VETERINARY INSPECTION WELCOMED ON ALL HORSES. Kindest of wishes to you all.